Like yoga and meditation, reading is a practice that has nourished me spiritually and emotionally. Others’ words have moved me, have brought to light my own words, and have added dynamic layers of meaning to my life. I’ve read hundreds of books, but these 12 present-day books are front and center in my library. Based on his own experience in concentration camps during the Holocaust and the experiences of others he treated later in his psychiatry practice, Frankl teaches that we cannot avoid suffering, but we can choose how to cope with it, find meaning in it, and move forward with renewed purpose. Tolle leads us on a spiritual journey to find our true and deepest self and reach the ultimate in personal growth and spirituality: the discovery of truth and light. Trungpa teaches that the sacred warrior conquers the world not through violence or aggression, but through gentleness, courage, and self-knowledge. The warrior’s power is in his or her belief in the basic goodness of human life and radiates that goodness out into the world to cultivate peace for others. Psychologist Mihaly Csikszentmihalyi’s reveals that what makes an experience genuinely satisfying is a state of consciousness called flow, where people typically experience deep enjoyment, creativity, and a total involvement with life. This classic reflects upon the rewards and challenges of simple living in natural surroundings. Through self-sufficiency and solitude, Thoreau demonstrates the power of introspection and self-knowing. Based on 15 years of research in energy medicine, Dr. Myss’s work shows how every illness corresponds to a pattern of emotional and psychological stresses, beliefs, and attitudes that have influenced corresponding areas of the human body. She also shows how we can develop the power of intuition as we simultaneously cultivate our personal power and spiritual growth. This book contains Krishnamurti’s best and most illuminating writings and talks, capturing his core teachings: the nature of personal freedom; the mysteries of life and death; and the ‘pathless land’, the personal search for truth and peace. This book is an invitation to wake up to the essence of what you are and experience the secret to happiness and liberation. Don Miguel Ruiz teaches these four principles to create less suffering and more love and happiness in our life: (1) be impeccable with your word, (2) don’t take anything personally, (3) don’t make assumptions, and (4) always do your best. Iyengar uses stories from his own life, humor, and examples from modern culture to illustrate the profound gifts that yoga offers. A very personal story of fear, anger, healing, and freedom, Kidd reveals a new level of feminine spiritual consciousness by embracing the sacredness of ordinary experiences and how doing so has the power to transform relationships in a woman’s life. This beautiful book is a collection of talks given by Chodron between 1987 and 1994 that explores how to overcome by pain and difficulties. 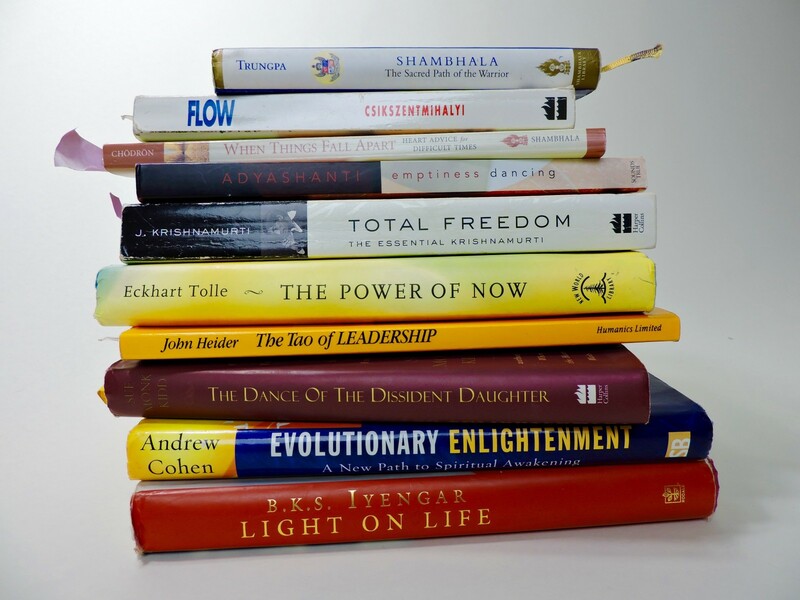 If you are a soul searcher like me, I encourage you to add these books to your reading list. Dive in and you will be surprised how many times you lose yourself and find yourself over and over again. Do you have a go-to book to share with us? Please share! PrevPreviousDoes this experience make me feel clear, bright, and fully alive?